These personalized fleece blankets are perfect when you need an extra big blanket for the baby. Made of thick and soft fleece material,the blanket dimensions are 50 by 60 inches. The vibrant purple color is suitable for boys or girls. 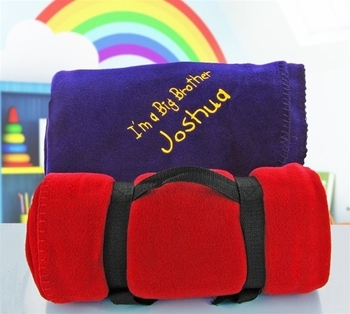 Each blanket comes embroidered with the personalized message that you provide up to 32 characters and comes with a strap for rolling it up securely. As shown in the photo, these are also a great idea for an older sibling to accompany a gift that you send to the baby! Processing Time Personalized: 3-4 business days. Does not include shipping time.